Sometimes you see an item of clothing and you just know that you need it right away! That's how I felt when I discovered this cute palm skirt! Usually, I like to wait for sales but this skirt was under $100 and it was so adorable that I was afraid that it might sell out before hitting the sale rack, so I purchased it immediately! 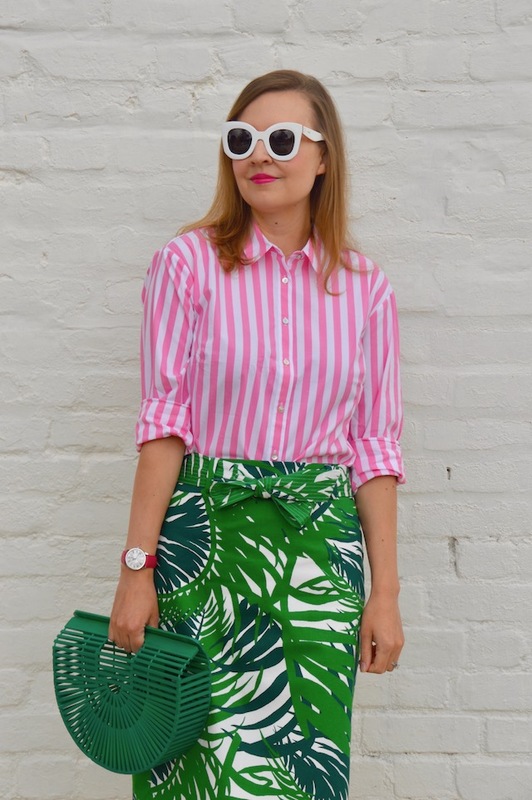 Although I can imagine pairing the skirt with many different tops, the first thing that popped into my mind was to do something with a pink blouse. Pink and green make for the perfect spring combination of colors, in my opinion! 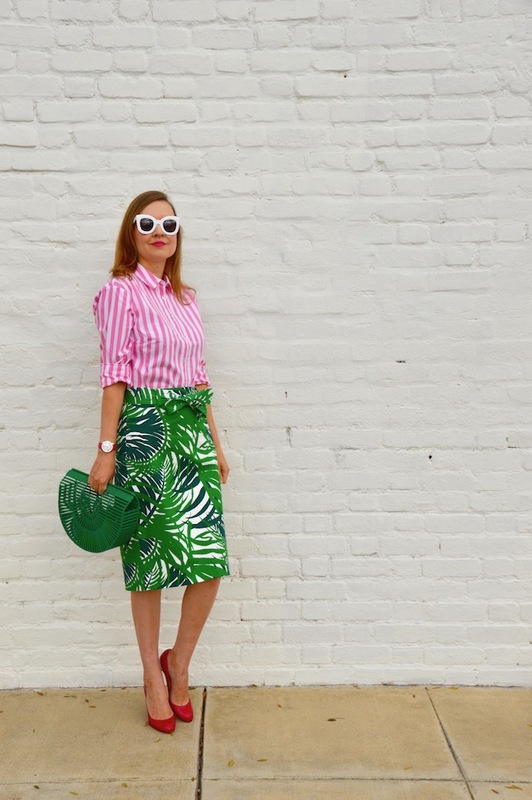 Luckily, I just recently purchased this stripped button down blouse from Target, so it was the perfect match for my new palm skirt! 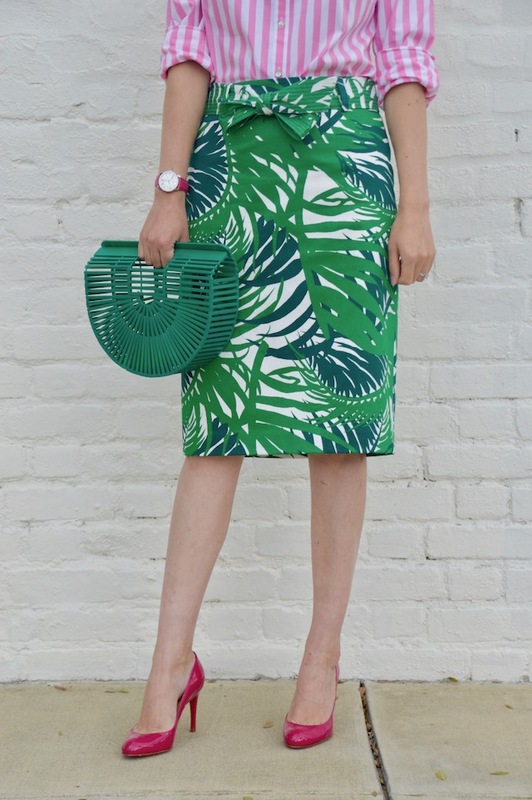 For the bag, I had to go with something to play up the tropical feel of the skirt. What better option than this green bamboo bag? I got this bag last year and while it isn't the most practical bag (my husband makes fun of it whenever I wear it and also likes to remind me of its impracticality! ), it does go with a lot of my spring and summer wardrobe. I'm tempted to get one in another color, maybe a neutral color down the road, but I'm pretty happy with my choice of green for my first bag in this style. I look forward to wearing it with many more pink and green outfits in the future! 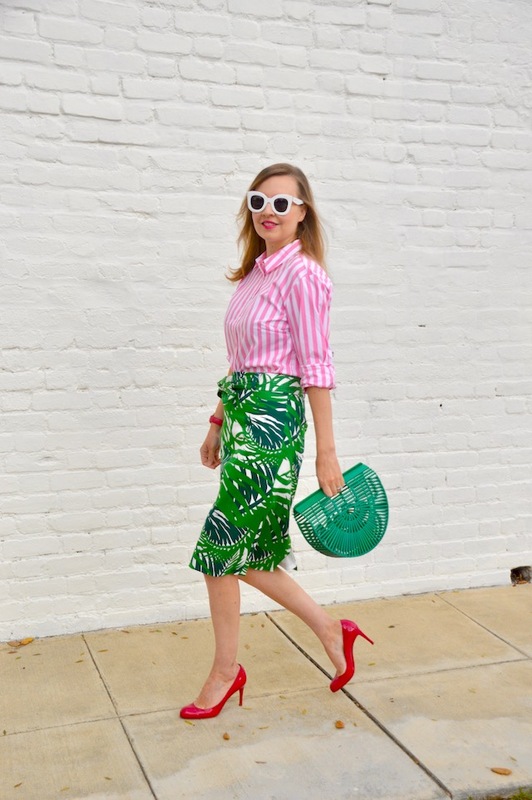 That is the cutest palm skirt and it looks great paired with pink! It's giving me all the beach and summer vibes - love it. You have such a very cool sense of style. Oh this is such a cute summer skirt! I love the palm print! LOVE this skirt!! I especially love it with the pink & white stripe shirt! So cute!! 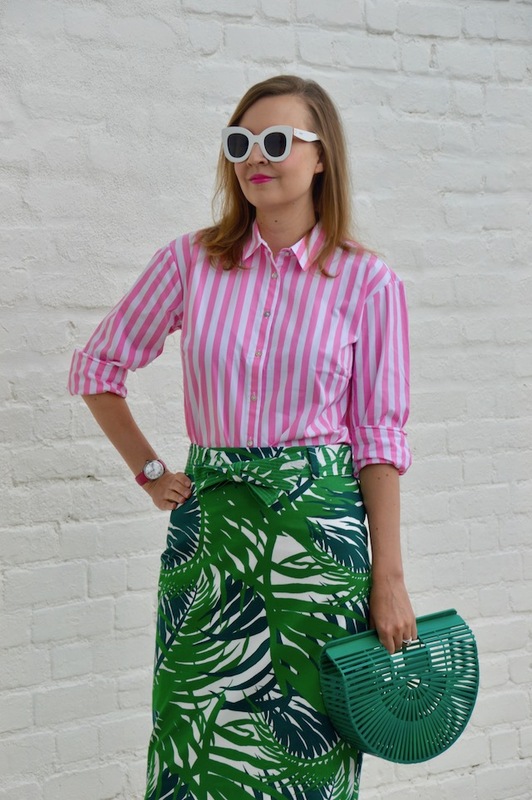 Wow, I love this skirt on you and the color/print is so fab! The bow detail is adorable and looks great with the pink. So fun to get a new bag for the Season, Ive never seen it in green!